If you are using Illustrator or Photoshop to lay out text intensive print pieces then this is for you! A common mistake for designers is to go with the program we are used to rather than the one that is best for the specific project. Adobe InDesign is the premier multi-page publication software. Quark Xpress had the market cornered until Adobe released and worked the kinks out of InDesign several years ago. 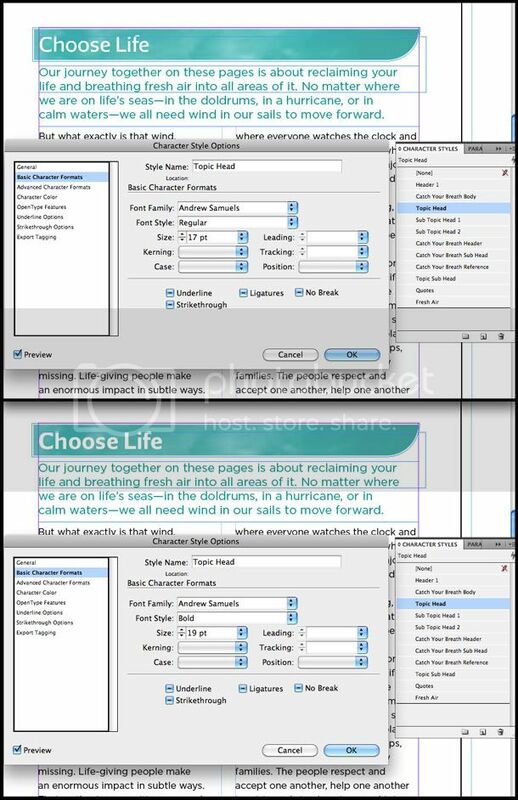 The main element that makes inDesign preferable over Illustrator and Photoshop is style sheets. You can set a Paragraph Style sheet for the whole publication. If you decide you want to change the font or even just one point size then all you have to do is change it in the style sheet and it will change all the text you have that style applied to. My favorite style is Character Style. You can set a style for section headers and sub section headers. If you decide you want section headers to be 4 point larger and bold all you have to do is change the style and it will change all section headers in the entire document. This tip is especially helpful for multiple pages but I think you will find it so helpful that you will even use it for one page print pieces. In the example below you see that by changing the font size and weight the header looks larger and bolder. This was applied to all headers in the multi-page document. Thanks for reading! Now make your life easier and use InDesign!